Recently on 20 April 2107, Lexis Suite Penang which is located at the beautiful shoreline of Teluk Kumbar, Penang, hosted the Media & Blogger Appreciation Night 2017 at its beautifully Japanese themed decorated Hibiscus Ballroom with its staff all dressed up in traditional Japanese attires. It was a fun-filled event with great food, great entertainment with bridal show and martial art session plus lots of lucky draw items to be won by its guests. Guests were even pampered with a brief massage session by Lex Spa. The interior was with a setup of how Lexis Suite Penang would decorate the ballroom for a customized wedding banquet. Of course the dishes served on that night would be Japanese cuisine as well with options such as Ninniku Chahan, Fried Lotus Roots with Konnyaku, Tori Katsu, Oden with Condiments, Chilled Seafood Platters, Sushi, Sashimi, Teppanyaki, Roasted Meat, Yakitori and a variety of desserts, not forgetting the cocktail, mocktail and coffee section. Thank you to Lexis Suites Penang for extending the invitation for a great night out. Ever since my first visit to Sushi Mentai @ All Seasons Place, Air Itam, Penang, I’ve been quite a regular at the eatery whenever my craving for Japanese cuisine arises. With the affordable yet quality plates of sushi (RM1.80++/ yellow plate or RM2.80++/red plate) on the conveyor belt, one would be pleased with their available options. Let’s have a look at some of their options available on their menus. What we ate indeed had the quality required and with such an economical pricing, who could resist not to consume more? Sushi Mentai do also serve many other selections such as Appetizer, Salad, Sashimi, Special Maki (special roll), Temaki (hand roll), Yakimono (grill), Agemono (fried), Menmono (noodles), Donmono (rice), Wanmono (bowl) and Beverages. Let’s have a look at some of their hot selling items as below. Just look at the thick cuts for the Salmon Sashimi (RM10.80++/5 pieces) or the Tako Sashimi (RM10.80++/4 pieces) and you would realize that both items were really value for money. On top of that, some of the great items would include the huge serving of Tori Katsu Curry Rice (RM13.80++), Chawan Mushi (RM3.80++), Asari Miso Shiru (RM4.80++), Chicken Teriyaki (RM9.80++), Salmon Mentaiyaki (RM14.80++), Tempura Moriawase (RM13.80++), Tori Teriyaki Don (RM12.80++), Kitsune Udon (RM10.80++), Riceless Inari Wrap (RM7.80++), Salmon Mentai Dragon Maki (RM12.80++) and more. As for beverages, I opted for a set of hot and cold green tea (RM1++ each). It came with a jug of green tea and a bucket of ice cubes with free-flow of refills. Overall, I’ve always happy with the quality of the dishes served here at Sushi Mentai, though it may not have the best flavors compared to some other high end Japanese restaurants with proper Japanese chefs. It was good enough to soothe my craving. All orders would be charged with a 6% GST and 10% service tax. Sushi Mentai @ All Seasons Place is located on the ground floor at the left wing of the building. You won’t miss it as it’s strategically in between Summer Dessert Bakery and Tomyummy Noodle House. You can park your car at the basement car park as you enter the building or right at the front area of the building. If you still do not know how to get there, you can always check out the location maps and use their Waze function. Address: 6G-1-13, All Seasons Place, Lebuhraya Thean Teik, 11500 Air Itam, Penang, Malaysia. From breakfast, lunch, dinner until supper, Wembley Café at The Wembley Hotel Penang would surely impress any diner with their sumptuous buffet spreads. Wembley Cafe provides accessible and affordable high quality food and service to everyone. Recently, I tried out their Thursday Japanese & Western themed buffet and was blown away by the amount of Japanese inspired dishes rather than being served with just sushi and sashimi. The buffet which would be served from 7.00pm until 10.00pm is priced at RM95nett (adult), RM48nett (child) and RM67nett (senior citizen). For Cheese, Soups and Bread, you would expect to find some International Cheese (with Crackers, Dried Fruits, Grapes & Honey), Kimchi Soup with Chicken, Miso Soup with Salmon Head & Belly plus Assortment of Rolls, Loaf Bread with Butter. There was also the Bubur Lambuk for the Ramadhan period. For Main Course, you would get a mix and match of Japanese and Western cuisine such as Yaki Udon with Seafood, Stir Fried Miso Butter Prawns, Mixed Vegetables (Yasai Itame), Roasted Tenderloin with Mustard & Peppercorn, Miso Honey Lamb Ribs, Chicken Teriyaki, Hasselback Potatoes, Baked Mussels with Ebiko Chili Mayo, Stuffed and BBQ Squid, BBQ Saba Mackerel, Barbecue Chicken with Italian Herbs, Garlic & Chili Flakes, Silver Anchovies XO fried Rice and Steamed Rice. At the BBQ, Tempura and Steamer Sections, you would find delicious items such as Chinese BBQ (Roasted Chicken, Roast Duck & Chicken Char Siew, served with Chicken Rice and Condiments, various ad-hoc prepared Tempuras (with Grated Radish, Ginger & Tempura Sauce) plus Chawan Mushi. The Asian Tapas Section would consist of Chicken Satay with Condiments and Peanut Sauce, Grilled Sausage with Chili Mayo, Sesame Balls, Corn on Cob, Japanese Okonomiyaki and Korean Pancake (with shoyu, vinegar, onion, garlic & green chili). For Fresh Fruits and Desserts, you would get items such as Assorted Fruit Platters, Cakes, French Pastries, Jellies, Tart, Kuih, Omochi, Ice Kacang (Red Beans, Herbed Jelly, Cendol, Cream Corn, Red Jelly & Pickled Nutmeg), Ice Cream (Chocolate, Vanilla, Strawberry, Green Tea and Yam with Mango Sauce, Strawberry Sauce, Vanilla Sauce, Chocolate Sauce and Condiments), Chocolate Fondue (Marshmallow, Cookies & Dried Fruits) and Freshly Brewed Coffee & Tea. Overall, I like the buffet spreads here as the dishes are of quality and freshness. The differences compared to many other hotels are that most of the dishes served here are in smaller portions and would be replenished freshly from the kitchen. Moreover, the different themes available daily would ensure that diners would get the best dining experiences. Let’s have a look at the dining promotions for the hotel from July to October 2016 as below. Do click on the photo for a clearer view. To get to the Wembley Cafe, just walk into the main entrance of the hotel and head to the elevator to go up to Level 2 of the building. You would see a bunch of friendly staff at your service. Wembley Café has a 24-hours in-room service to cater to in-house guests. Address: 183, Jalan Magazine, 13000 Penang, Malaysia. About Cititel Hotel Management Sdn Bhd (CHM): Cititel Hotel Management Sdn Bhd (CHM), is an established hotel management company with an inventory of over 4400 rooms and employee strength of over 2300. It is known for its collection of centrally located hotels and continues to actively seek opportunities in key Asian cities to build and expand its portfolio, particularly in the three and four-star categories. CHM is a subsidiary of the renowned IGB Corporation Berhad, a Malaysian property and investment holding company, acknowledged for its excellence in both commercial and residential property development. Just like our Malaysian Nasi Lemak, various versions of ramen are ubiquitous throughout Japan, from small roadside stalls, restaurants to even within 7-Eleven shops. Each region in Japan would offer their unique versions of ramen with their “secret” soup base which might consist of a mix and match of salt, soy sauce, pork bones and fermented soy beans (shio, shoyu, tonkotsu and miso), served with various toppings. With the globalization of the ramen, competitions had found many eateries serving innovative versions of the noodles with peanut butter or coffee infused broth or even making the ramen into ramen burger. 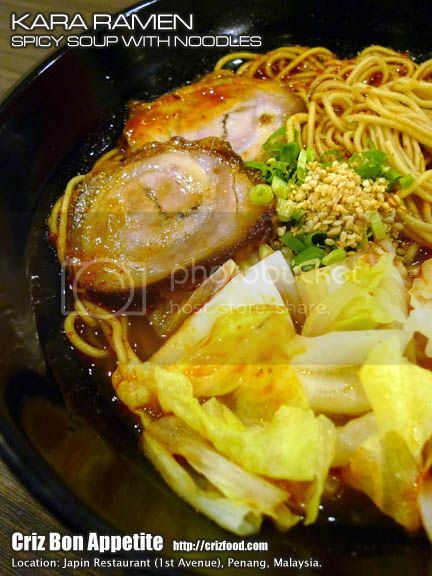 However, Menya Miyabi @ Queensbay Mall, Penang, still insist on pepping up their authentic Hokkaido ramen, using mostly imported ingredients, to ensure that diners would get the best ramen experience as how the people of Hokkaido would consume. The flavors of the ramen dishes are so strictly monitored that the big boss (with 4 other ramen chains in Hokkaido) would fly in every quarterly to check on the food quality. A 10% service charge would be imposed on all orders. The first dish which was the Hokkaido Chilled Ramen Salad (RM19+), had us all at cloud 9 with its unique combinations of flavors and textures as most of us had never tried out chilled ramen before. With just some al dente textured ice-chilled ramen with some goma mayo dressing, served with sides of hard-boiled egg, julienned chashu, cucumber, buttered corn kernels and tomato slices, it was a simple yet appetizing salad for everyone. For our main, we had their Signature Tonkotsu Ramen (Pork Broth Flavor – RM23+). Wow! I’m impressed with the rich and creamy broth which was filled with collagen with a light tone of natural saltiness. The ramen dish has slices of nicely braised chashu, served with some wood ear fungus, marinated soft-boiled egg, nori (seaweed) and some light sprinkles of spring onions. It was indeed a hearty bowl of perfect ramen, obvious from the time consuming and tedious processes of slow simmering the choice pork bones. We also tried out their Yaki-Miso Ramen (Fried Soybean Paste Flavor – RM23.50+). The broth was similar to the Tonkatsu Ramen but with some added fried miso paste to give the broth an extra earth flavor. The toppings were somewhat different slightly with bamboo shoots replacing the wood ear fungus as the former. Taste wise, it was indeed the authentic taste of Japan, which was a bit heavier in saltiness. Somehow, the Kara Miso Ramen (Hot & Spicy Miso Ramen – RM24+) tasted superb. Though the broth tasted almost similar to that of the Yaki-Miso Ramen with added chili paste but the overall flavors were quite balanced up with no overpowering saltiness. I guessed raw miso paste was added instead of the fried miso paste which would surely contain more concentrated sodium content. The ramen came with toppings such as chashu cubes, marinated soft-boiled egg, bamboo shoots, salted mustard stems, nori (seaweed) and some chopped spring onions. For spicy lovers, this might be your ramen dish to go for. For those who prefer rice over noodles, you can always try out their Katsu Curry (Katsu Kare – RM24+), a steaming hot Japanese rice dish with non-spicy Japanese style curry gravy, topped with a piece of breadcrumbed deep fried pork cutlet and served with some pickled daikon. Now only was I aware that traditional Japanese Curry would be served plain without the addition of potato and carrot bites as I had consumed elsewhere. The most important ingredient in a Japanese kare is to extract the sweetness from the caramelized onions and traditional recipe might just include only onions, flour and oil. From a clarification by my Japanese friend, potatoes and carrots were later added into the recipe to make the filling bulk when rice supplies were scarce during one period of the past. To add on to our orders of ramen, we ordered some Croquettes (Korokke – RM9+ for 2pcs). The potato cakes had a concoction of mashed potatoes, minced meat and some finely chopped vegetables before being coated with panko breadcrumbs and deep fried to perfection. Though the korokke was simple and tasty, I somehow prefer my croquettes to contain more coarsely mashed potatoes such as the Indonesian/Malaysian Bergedil with more bites. 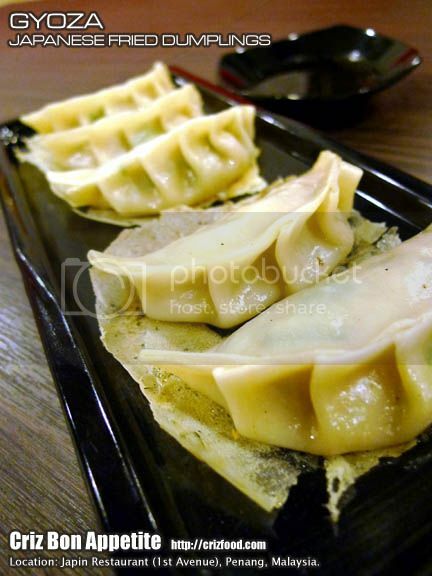 We also ordered some Gyozas (RM12+ for 6 pcs, RM18+ for 10 pcs). Each bite was filled with the nice juiciness from the well marinated minced meat within. If I were not told by the chef, I would not have realized that each piece was machine made. Menya Miyabi is the only Japanese eatery in Penang having that customized machine specially imported all the way from Japan. Overall, I quite like the simplicity of the dishes served at Menya Miyabi. It might depend on the taste buds of the locals to accept a more authentic style of Japanese cuisine which would be stronger in flavors. With mostly imported ingredients used in their cuisine, the prices of their dishes are still competitive on the market. Upon entering the main entrance of Queensbay Mall (Central Zone), turn right and walk towards the North Zone (J.Co, Morganfield, T.G.I. Friday’s, Maybank, etc). Take the escalator to Level 1 and you can see Espresso Lab kiosk. The restaurant is just opposite the kiosk on the right. Address: 1F-152, Level 1, North Zone, Queensbay Mall, 11900 Bayan Lepas, Penang, Malaysia. Though Sushi Mentai’s may look simple with only 25 sushi options for both yellow plate (RM1.80++/plate) and red plate (RM2.80++/plate) category respectively on the conveyor belt, you would be in for surprises as they do occasionally come out with many other interesting and flavorful creations (not from the menu) to tempt the taste buds of its diners. Let me show you some of the recommended ones as well as new signature creations such as their Tamago Mentai (yellow plate – egg), Chuka Kurage (yellow plate – jellyfish), Salmon Mentai (red plate – fish), Ebi Fried Kani Maki (red plate – prawn) and Ebi Tempura Fountain (red plate – prawn). Wow! No wonder the restaurant went by the name Sushi Mentai as their in-house concocted Mentai sauce (a combination of mentaiko aka cod fish roe with mayonnaise and maybe with a light squeeze of lemon juice) surely did sharpen up the flavors in each of their creation. I quite like the distinctive flavors and textures in their Ebi Fried Kani Maki as the crispiness from the added batter fried prawns wrapped in some lettuce combined with the fluffy yet chewy vinegar added Japanese rice was just perfect. It had mild touch of sesame oil added and it made the whole concoction quite addictive in each bite. Another must note would be their Ebi Tempura Fountain, something so simple and yet brought out the real taste of sushi. It had sushi rice stuffed inari (fried bean curd pocket) topped with a whole tempura prawn and drizzle with a light touch of nikiri (Japanese sweet soy sauce) and mayonnaise, then garnish with some ebiko (shrimp roe) and some chopped greens. Instead of just sushi, there are many other selections in their menu ranging from Appetizer, Salad, Sashimi, Special Maki (special roll), Temaki (hand roll), Yakimono (grill), Agemono (fried), Menmono (noodles), Donmono (rice), Wanmono (bowl) and Beverages. You can click on the menu link up there for their full range of dishes. Let me share with you my dining experiences with some of the dishes ordered starting with an appetizer called Chuka Idako (seasoned baby octopus – RM4.80++). You can practically taste all the sweet and sesame oil infused flavors in each of the nicely braised marinated baby octopus. The best part was that the dish was served chilled to my expectation. As for sashimi, I would always go for fresh salmon cuts and indeed their Salmon Sashimi (RM10.80++/5 pieces) was really value for money. Other than at some buffet spread where I could eat all the salmon sashimi I ever wanted, I’ve yet to find an eatery serving such thick slabs of sashimi at such a low price. Their signature maki set of Salmon Mentai Dragon Maki (RM12.80++) was a hit on my list as the batter fried prawn rolls with torch burned mentai sauce coated salmon slices were heavenly to my palate of quality Japanese dishes. For some grilled seafood, I opted for their Salmon Mentaiyaki (RM14.80++) which came with two piece of mentai sauce coated grilled salmon. The taste wasn’t that bad but it could have been better if the fish were to be of a thicker cut. Anyway, I’m not complaining as the price was quite reasonable compared to paying over RM20++ dining elsewhere for such portion served. I wanted something light yet fulfilling at the agemono section, thus I tried out their Takoyaki (squid tentacle filled wheat flour ball – RM4.50+/5 pieces). I would say these were some of the good ones I had for awhile as each has just the right juicy bite and were dressed with takoyaki sauce and mayonnaise plus generously garnished with lots of nori and bonito flakes. I had their Tempura Udon (RM13.80++) as my next dish. The dish may look rather simple with some udon in clear soup topped with some nori (seaweed) and two pieces of the Japanese fish cakes, on top of the two tempura prawns but the serving of udon was humongous. Instead of the standard serving of 120g for udon, the serving was almost 170g, which meant it was a big too much for small eaters whom would want to savor their other dishes. However, I would want to compliment them for the soup broth. This was the type of rich flavored dashi stock base I would love to consume with my udon especially on a humid day. Sushi Mentai has the reputation of serving great Japanese curry, thus I also tried out their Tori Katsu Curry Rice (RM13.80++). Gosh! I was dumbfounded with the amount served for this dish. Are they sure that this was the portion for one person? The dish had half a plate filled with compactly cooked Japanese rice and the other half filled with loads of potato and carrot chunks in Japanese curry and topped with a whole deboned breadcrumbs fried drumstick. One glance at the dish and I was already feeling full~ LOL~ 😛 Anyway, for those big eaters, you would be happy to order this dish. Maybe it would be also be a great idea to share this dish with another friend so that you can consume more options. I loved the sweetness of both the potatoes and carrots with a light hint of citrus flavor enhanced non-spicy curry powder broth. On the other hand, the choice of using deboned chicken drumstick was ideal for this dish as the meat was moist and tender as it should be. The rice set came with a complimentary bowl of miso soup. Instead of ordering the usual Chawan Mushi (RM3.80++) or Miso Soup (RM1.80++) as I normally would do, I saw one dish that was rather unique I have yet to see from other Japanese restaurants. It was their Asari Miso Shiru (RM4.80++). The bowl of soup was basically miso soup with added clams. I had it quite a few times at one Korean restaurant and had fallen in love with the richness and sweetness of the soup and finally I can find it at Sushi Mentai. For the price, it was a hearty bowl of soup filled with lots of juicy clams plus generous amounts of nori and bean curds. As for beverages, I opted for a set of hot and cold green tea (RM1++ each). It came with a jug of green tea and a bucket of ice cubes – all free-flow. It was a great bargain. Overall, I’m happy with the taste and quality of the dishes served here at Sushi Mentai. It might not be the best compared to some other upper class Japanese restaurants with proper Japanese chefs but it was good enough to soothe my craving when I needed some Japanese cuisine. The damage for the whole meal was RM109.75 inclusive of the 6% GST and 10% service tax for two pax. However, the amount of dishes we ordered would be adequate for 3-4 persons. With such economical pricing, do expect huge crowds during peak period of the day, especially during weekends. Please also take note that they would not entertain any prior reservations as their system is on a first come first serve basis. No worries as they do also provide sitting area right in front of the eatery while you wait for your turn. 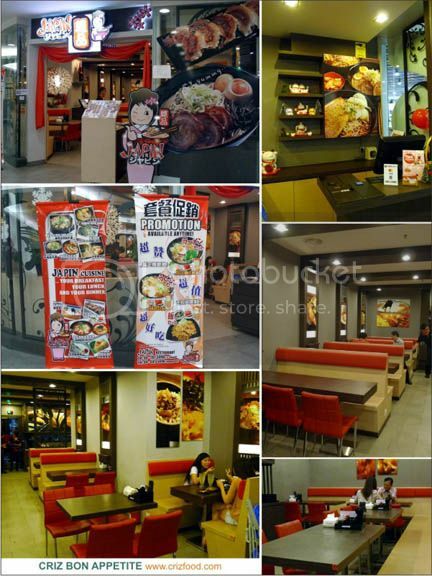 For those workers at the UNESCO Heritage Site of George Town, Penang, you are in luck as a new self-service Japanese fast food by the name of Sumo Sumo Fine & Fast Japanese Food Restaurant has recently opened an outlet along Lebuh Bishop, Penang, on 7 September 2015. The concept is real simple. You walk in, order your food from the menu at the back of the counter, pay for your food, collect a number and wait for your collection of your orders. You can even add on a cold or hot beverage with an additional RM1.50. The best part is… all items are NETT PRICE. There are also ample seats available for a quick meal. For those who love to have rice (don), there are some impressive dishes on the Don Series. One of the most ordered items on this list would be their Sumo Chicken Don (RM9.90nett). The bowl of goodies had a base of steamed rice (a mix of Japanese & Thai rice grain) with a light drizzle of sweet gravy, topped with some slices of karaage chicken slices with some homemade salad dressing. It came served with a generous amount of fresh greens. Impressive! It had just the right amount of steamed rice to keep your tummy filled. Another impressive to my liking would be their Teriyaki Salmon Don (RM13.90). It came with quite a large slab of grilled salmon topped with some teriyaki sauce and lots of fresh greens too. Slurpilicious! For those who love to have some Japanese curry over your rice, their Tempura Curry Don (RM9.90) can be quite tasty. To my surprise, I thought they would just serve the rice with some vegetables tempura, but they did add in a tempura prawn too. However, I did find the curry base to be a bit too mushy due to the usage of too much blended potatoes. Moreover, it did lack a touch of fruity green apples to enhance the flavors and bost up the appetite. Overall, it was still a great dish to savor and real valued for your money. I did also try out their Udon Noodles with Teriyaki Chicken (RM11.90). I was impressed with the quality of udon they were using. It was not the soft soggy type but one with the right al dente texture to please my taste bud. Moreover, the broth had just the right balance of flavors from the usage of fresh ingredients. I also liked how they served the teriyaki chicken on a separate dish as I could taste out the flavorful marinate on the nicely grilled chicken. At the moment, they only have Karaage Chicken (RM4.50) as side dish. This was the dish that would normally be sold out quite fast, especially during lunch time and it was also the main item on their Sumo Chicken Don set. Overall, it was a nice side dish to add onto your order. However, it was a bit salty to consume by itself unlike with the Sumo Chicken Don set which would come with some rice and greens to balance up the total flavors. I would advise the kitchen to minimize the salt usage as the salad dressing itself would have been adequate to boost up the overall flavors. Overall, I do find the items served here to be simple and yet appetizing. For that reasonable price you are paying for a rather balanced diet, you can’t complain much right? The only setback is that they are still new and still need some rooms for improvements to get their kitchen stock right. Some items on the menu could be sold out even before the end of lunch time as they have quite an impressive amount of takeaways. I hope they rectify this issue soonest possible. On top of that, I hope they will have some desserts on their menu as well. Who won’t love some konnyaku jellies or some matcha ice cream with their meal? It’s easy to locate the restaurant as it’s just next to the Acupaday Café (same row as Bank Simpanan Nasional (BSN) and opposite to Sentral College). Though finding parking spaces can be quite hard during lunch time, you can always call up to make your order and then drive up to the shop to self collect. Address: 57, Lebuh Bishop, 10200 Penang, Malaysia. If you are into authentic Japanese cuisine and love to have a healthy yet fuss-free spread of choices, you should pay Enoshima Japanese Restaurant @ Cititel Express, Penang a visit. Not only would you get to relax in their cozy yet relaxing ambience, you would get to savor their hot and fresh serving delicacies during lunch or dinner. Their menu could be quite extensive with options such as appetizers, salads, sushi, sashimi, hand rolls, western fusion, obanzai (native Kyoto traditional cuisine), kushiyaki (skewed items), grilled, deep fried, teppan (skillet fried), rice, noodles, nabe (hot pot dishes) and ala carte dishes. All orders would come with a 10% service charge. While your meal is being prepared in the kitchen, you would be given some appetizing pickles to boost up your appetite. Basically, it was just some pickles of cucumber, carrot and daikon slices. To start off, you can always try out their Mixed Vegetables Tempura (RM20+). I’m actually quite fussy when it comes to tempura items but I found the crispiness of the batter was just right to my palate. The tempura went well with their tentsuyu sauce. As for main dish, the restaurant has quite a selection of choices. I ended up having their Salmon Teriyaki Sushi Set (RM42+). It was a fulfilling combination as I love salmon as well as sushi. The salmon was grilled just right with a light glaze of teriyaki sauce. Perfect! The 7 pieces of sushi were fresh with every bite. The set would also be served with salad, stir fried mixed vegetables, chawanmushi, miso soup and fresh fruit cuts of the day. If you are rushing for time, you could always try out their Omu Rice (RM16+). Instead of having just plain fried rice in my egg wrap, I had requested for garlic fried rice. The kitchen replaced my rice without additional charges. What a great service. However, it was not of the standard I had expected. No doubt the seasoning and flavors of the garlic fried rice were perfect but it somehow lacked the “wok hei” aka “high heat cooking” I was expecting from a great plate of aromatic yet slightly burned taste of fried rice. Overall, it was still a nice place to hang out with family members or friends over some simple yet fulfilling meals. I would love to head back to the restaurant some day to try out the rest of their cuisine. 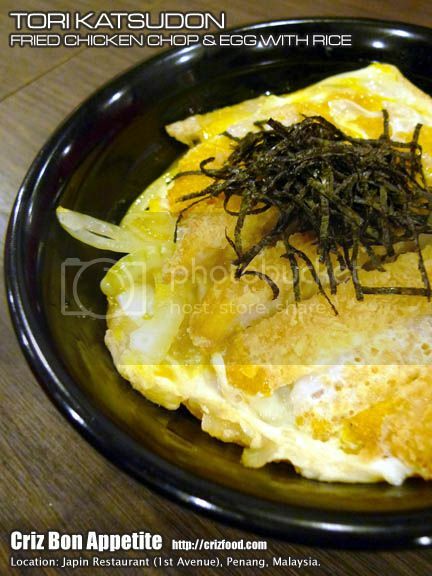 Since Enoshima Japanese Restaurant is the sole eatery in Cititel Express Penang, they would also serve breakfast too but it’s just a hassle-free and simple breakfast for the hotel’s guests. Walk-in diners would be charged RM20+/pax. 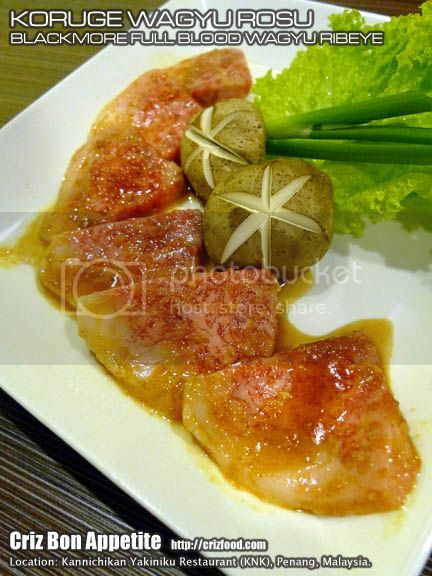 The Enoshima Japanese Restaurant can be located at the lobby of Cititel Express Penang. As you enter the lobby of the hotel, turn left and walk up the stairs and you will see the restaurant on your right. If you are coming in via St Giles Wembley Penang, turn right upon entering the lobby and walk up to the lounge area. You would see a door on your left. Open the door and just follow the passage way and it would lead you up to another entrance of the restaurant. Address: 123, Lebuh Noordin, 10300 Penang, Malaysia. For the last few years, more and more Japanese restaurants are popping up in Penang. Some of these restaurants are charging quite an exorbitant pricing for their cuisine and did not quite suit the budget of many locals. However, one restaurant with quite a few branches has always been receiving endless streams of loyal diners. The name is Japin Restaurant. We managed to pay a visit to one of the branches at 1st Avenue recently. 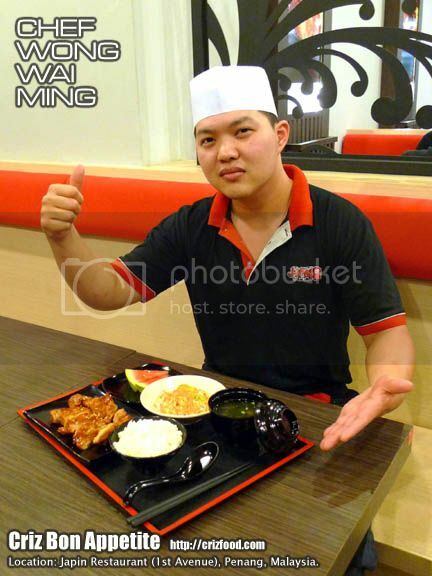 This outlet’s kitchen is managed by Chef Wong Wai Ming. For ramen lovers, you would not regret ordering their signature Kakuni Japin Ramen (Stewed Pork in Rich Soup Noodles/滷肉絕品拉面 – RM16.80+). 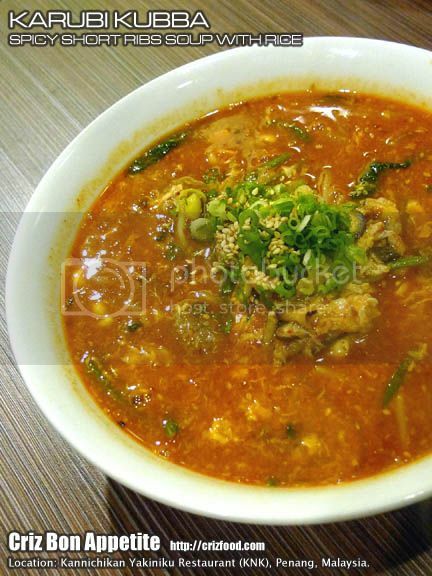 You can practically taste the thick flavors in the broth which had been carefully simmered for more than 72 hours. 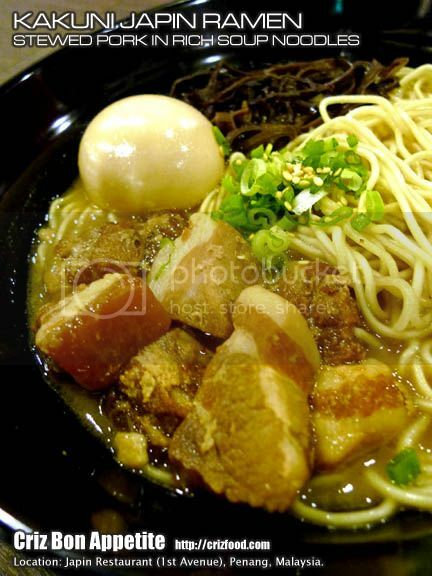 The noodles were served together with some succulent and tender pieces of pork belly meat, wood ear fungus, a runny Ajitama soft boiled egg plus some chopped spring onions and toasted sesame seeds as garnishes. Instead of the thick broth type of ramen, you can also try out their Kara Ramen (Spicy Soup with Noodle/香辣拉面 – RM13.80+) with has a light strength of soup with some kicks of spiciness. The noodles were served with some slices of specially prepared pork, some vegetables plus some chopped spring onions and toasted sesame seeds as garnishes. You can request for the spiciness to be adjusted based on your preference. There would also be some udon dishes available such as their recommended Kaisen Kimuchi Udon (Seafood & Kimchi Soup with Udon Noodle/海鮮泡菜烏冬面- RM20.30+). 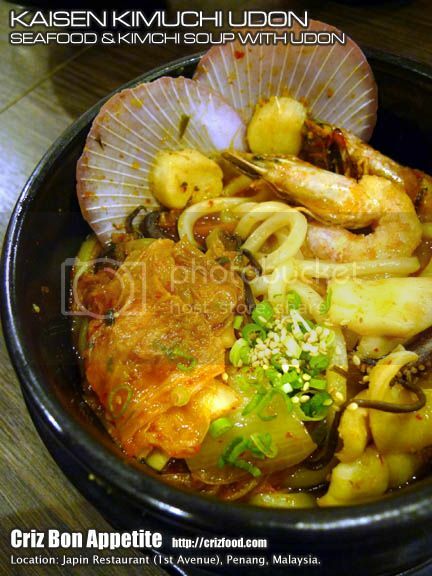 The soup base was almost similar to the Korean’s Haemultang (해물탕), a spicy hot seafood stew. It was like having a chili boasted rich bowl of seafood stock with a nice al dente bite from the udon noodles. The dish had some scallops, prawns and squids, wood ear fungus, kimchi with some chopped spring onions and toasted sesame seeds as garnishes. Somehow, I always like to order rice dishes such as the Tori Katsudon (Fried Chicken Chop & Egg with Rice/炸雞扒盖飯 – RM12.80+) as it’s more filling for me. Each bowl of sweet sauce boosted Japanese rice would be topped with a piece of chicken chop carefully folded in with some egg and onions. The dish here was not overly drenched in sweet sauce as those I had tasted before. This version had some nori (seaweed) as garnish. A set meal would never go wrong in any visit to a Japanese restaurant. 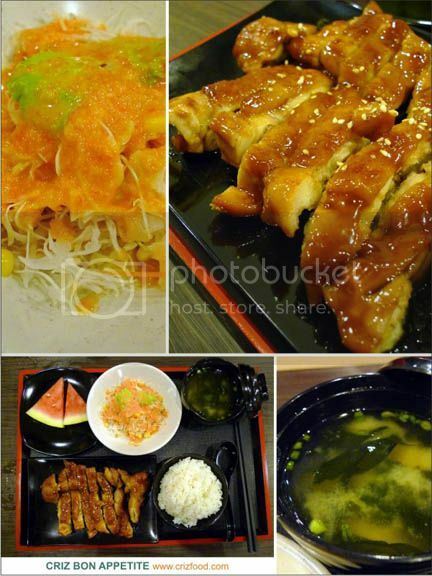 I was impressed with the pricing for their Tori Teriyaki Tei (Teriyaki Chicken Set/蜜汁雞套餐 – RM17.80+). On top of the nicely prepared succulent piece of chicken, there was also the hot steaming rice, salad with their own special dressing, miso soup and a few fruit cuts. It was a value for money set deal. As for side orders, Gyoza (Fried Dumpling/日式餃子 – RM6.80+) was one dish that was simple and yet filled with a punch of goodness. There was a bit of crisp on the surface form a thin layer of batter used and the filling had that moisture just like when you have your Siu Long Bao. These dumplings would be best consumed when hot with a bit of the accompanied black vinegar. I won’t mind having some julienned young ginger added in the condiment as well. I was surprised that their Mikkusu Yakiniku (BBQ Sauce Fried Mixed Meat/日式醬燒 – RM13.80+) was categorized as part of their “Side Dishes”. It was a portion that might be even too much for a small diner. However, ever since my visit to Kannichikan (KNK) Yakiniku Restaurant not long ago, I’ve been longing for some nice meat. The mixed meat palate here was awesome with choices of beef, chicken and pork, in whatever combination suit you best. 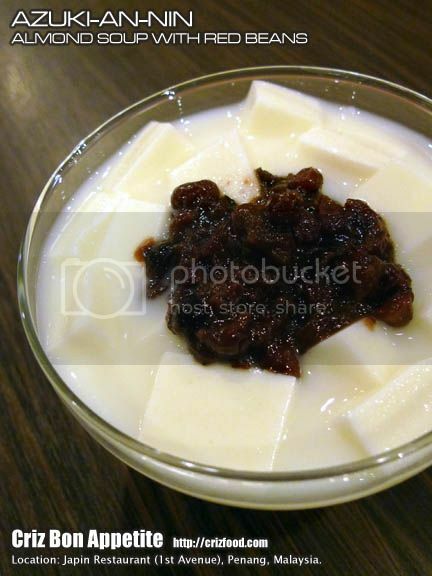 As for dessert, we had the Azuki-An-Nin (Almond Soup with Red Bean/甜豆杏仁 – RM6.80+). The named “soup” can be rather deceiving as what we had were some almond jelly cubes in mildly sweetened syrup topped with some sweetened red beans. No doubt it was simply refreshing for me, it might not be the type of dessert for those who detested the flavors of Chinese almonds. If you love it, this could be one of the nice desserts after a hefty meaty meal. Overall, Japin Restaurant does provide a substantial amount of good quality dishes that would please the appetite of major diners. On and off, they do also come out with impressive promotions that would be value for money. 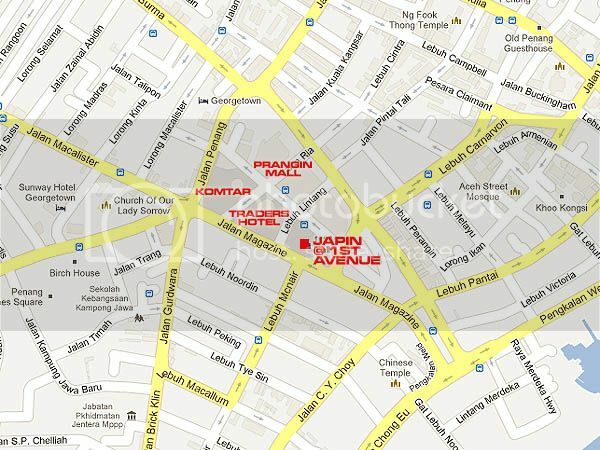 Japin Restaurant is located at the basement of 1st Avenue, Penang. This outlet has been in operation since May 2012. To find the restaurant, just walk towards Kim Gary and you will see the restaurant just on the right side of the restaurant with quite a number of standing banners displayed outside the outlet. 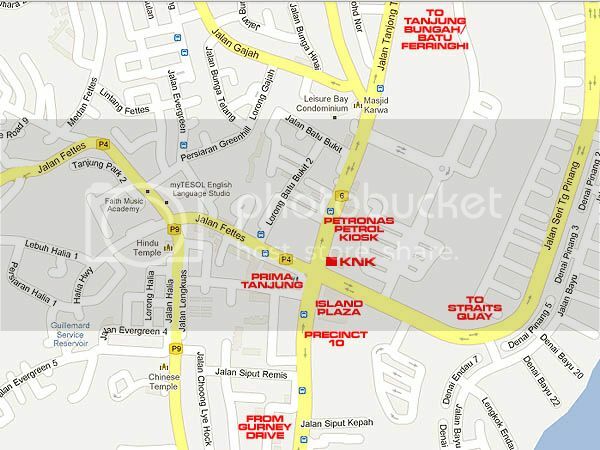 Address: LG-10, 1st Avenue, 182 Jalan Magazine, 10300 Penang, Malaysia. 2F-147, Queensbay Mall, 100 Persiaran Bayan Indah, 11900 Bayan Lepas, Penang, Malaysia. 34, Ground Floor, Jalan 27/70A, Desa Sri Hartamas, 50480 Kuala Lumpur, Malaysia. When you speak about BBQ on the table, the first thing that would come into your mind would most probably be the Bulgogi, the Korean style BBQ, the Asian style of BBQ Steamboat or maybe the Thai’s Mookata, BBQ Steamboat. 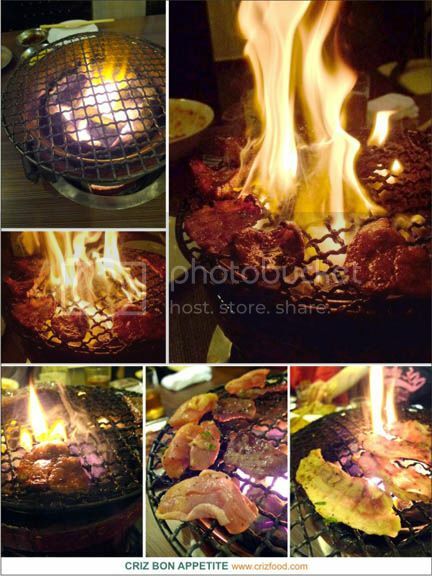 How about the Japanese style of grilling meat called Yakiniku? What about a fusion between the Japanese and Korean style of BBQ? Would you love to try on that? 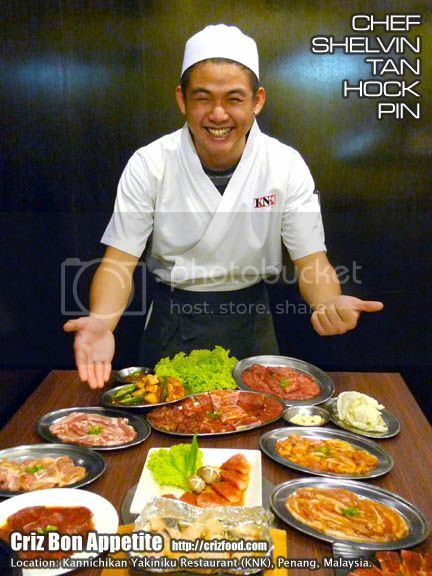 For the last decade plus, Kannichikan Yakiniku Restaurant (KNK) has been providing this Japanese styled Korean BBQ concept to the Malaysians starting with its first branch in Penang as far back as August 2000 (more branches are stated below). They are the first to my knowledge to have imported Kuroge Wagyu (Japanese Black) and did the choice cuts themselves as well as providing those diners with acquired taste the options to savor the best of beef “spare parts” such as bowels, intestines, tongues, fardels/multipliers (omasum) and pillar tripes. I had the privilege to be invited not long ago to try out some of the dishes available at the pioneer branch located along the main road of Jalan Tanjung Tokong, Penang. This outlet’s kitchen is managed by a young, energetic and jovial chef named Chef Shelvin Tan Hock Pin, who had years of experience working for the husband and wife owners. KNK do provide some of the best meat cuts such as beef, pork, chicken and seafood for your grilling pleasures. Of course the best cuts would still be the Kuroge Wagyu Rosu (Blackmore Full Blood Wagyu Ribeye – RM108++). This high priced wagyu beef is known for its marbling characteristics and quality with a high percentage of oleaginous unsaturated fat. The grilled meat would flavorful by itself and just melts in your mouth. Another option would be the Wagyu Bara (Premium Wagyu Short Ribs – RM59++). The cuts were mildly marinated with the chef’s secret recipe. Though tender and juicy, you can’t compare the texture and bite with the former as they were of the top quality. 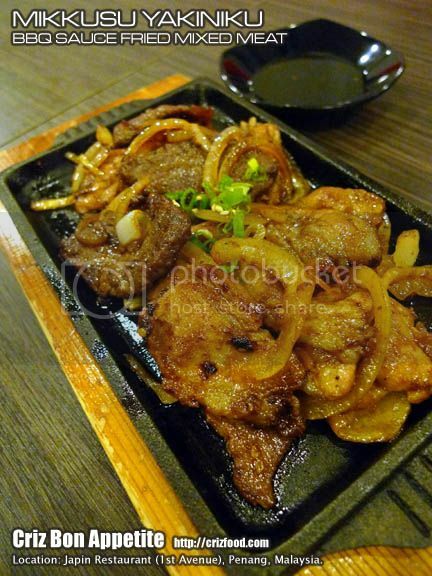 Tokuzyo Rosu (Wagyu Ribeye – RM39++) would also be available for your selection. 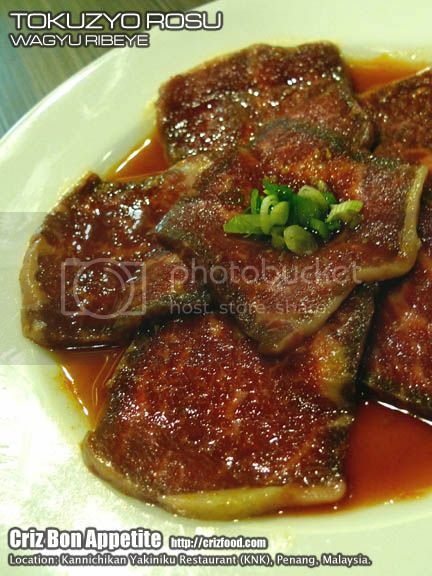 Same as the above, it was mildly marinated to bring out the best in its flavors. 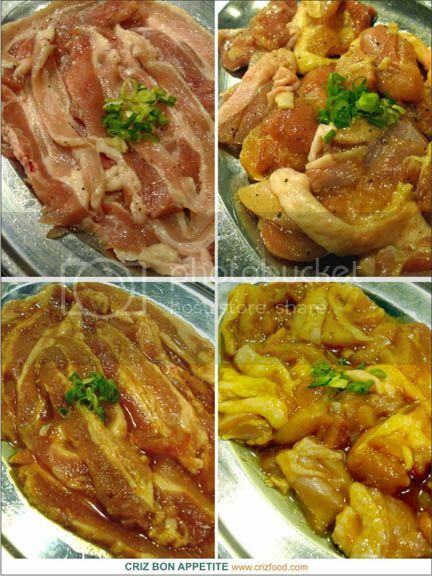 Other non-beef options would be the Buta (Pork – RM23++) and the Tori Momo (Chicken Thigh Meat – RM19++). Both the meat cuts came in two different marinates. One would be a simple marinate of sesame oil, salt and pepper while the other one would be with a special combination of sesame oil, chili flakes, sesame seeds, miso with a light touch of apple juice. KNK uses a Japan imported type of biomass briquettes which would sustain high heat for an hour plus and yet produce minimal sparks and little ash, though giving the meat some mild smoky flavors. These briquettes would be filled in a Shichirin, a Japanese barbecue grill with a custom made “netted” brazier that has been preheated at the right temperature to prevent meat from sticking on it. Just a reminder here to diners who have no experience in BBQ techniques. Please be informed that turning or poking at the meat too often would flare up the charcoal, thus making the meat scorched easily. 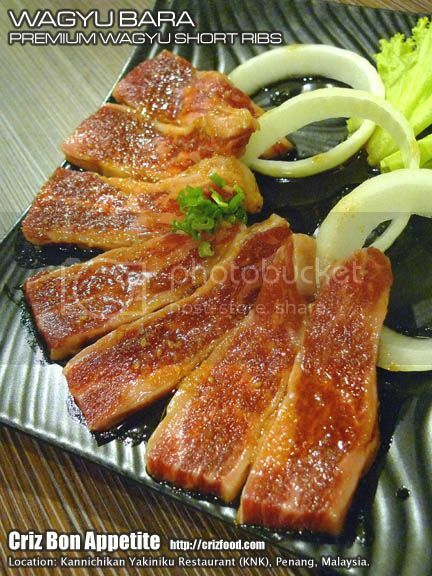 For those who would love to have a try on the Yakiniku, there’s always the KNK Set for Two Pax (RM119++). The cuts given would include Zyo Tan (Prime Beef Tongue), Karubi (Bone-in Prime Short Ribs), Zyo Rosu (Prime Ribeye), Zyo Bara (Prime Short Rib), Harami (Skirt Flank), Kimuchi Moriawase (Kimchi Mix) and Chisya (Lettuce). 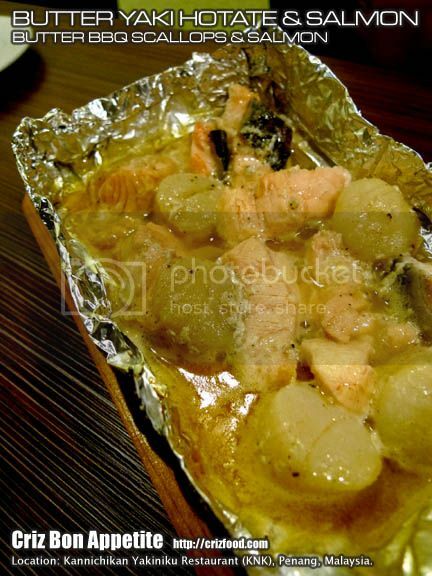 Other than just items for grilling, KNK also do provide other precooked dishes such as the Butter Yaki Hotate & Salmon (Butter BBQ Scallop & Salmon – RM35++). For those who prefer some rice dishes, there’s always the Ishiyaki Bibinba (Stone Bowl Rice with Korean Vegetables – RM20++). 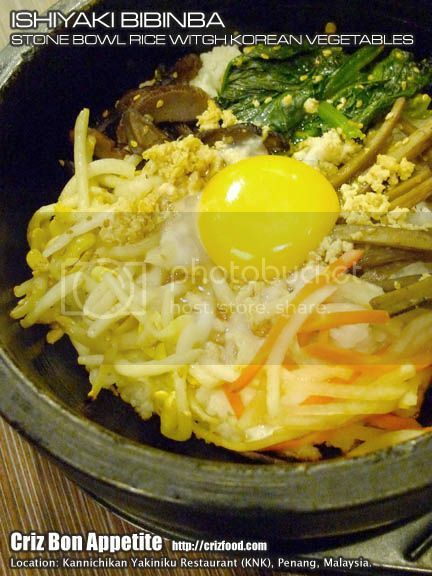 This is the Japanese version of the Korean’s Bibimbap. There would be some Japanese steamed rice in a hot stone bowl topped with minced chicken, raw egg, spinach, shitake, bean sprouts, carrot, radish and gobo roots (Arctium lappa roots/burdock roots/牛蒡) which has great medicinal properties as blood purifier. For spicy lovers, Karubi Kubba (Spicy Short Ribs Soup with Rice – RM17++) would also be available. You can practically taste the rich stock flavors with a tad of spiciness. Each bowl would come with rice topped with a spicy soup base which consisted of squids, beef, shitake, spinach, bean sprouts, carrot and radish. 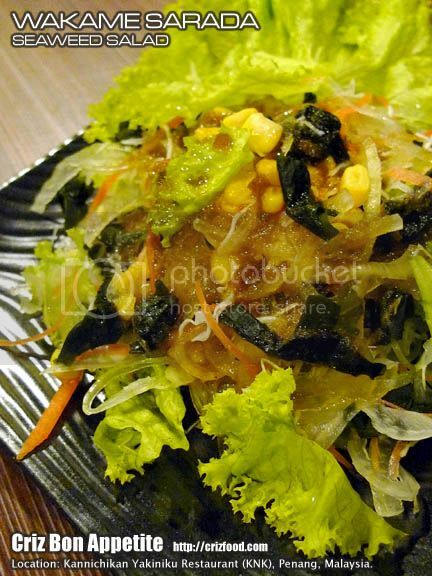 For a lighter palate, you could order their Wakame Sarada (Seaweed Salad – RM12++). It has a light touch of wasabi dressing just mild enough for anyone. 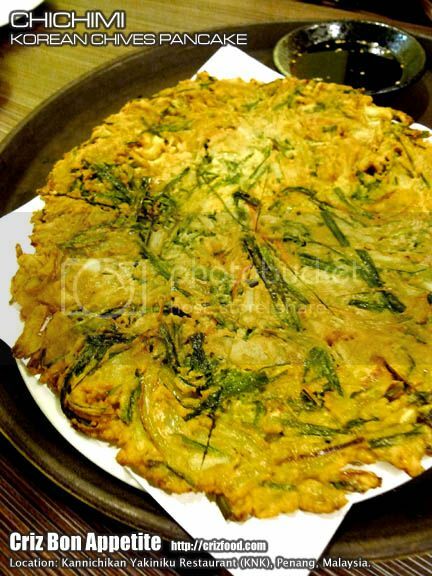 Lastly, I simply love how KNK prepared their Chichimi (Korean Chives Pan Cake – RM18++). It was not as starchy as I had tried elsewhere and with a nice crisp bite. It has basically egg, flour, chopped onions and chives in it. The dish went well with the condiment which has a slight sourness with a touch of fragrant sweetness from the added soy sauce and sesame oil. Overall, Kannichikan Yakiniku Restaurant has the right flavors for the BBQ items. Simplicity is always the best for tasting the original flavors from the chosen meat. Moreover, not many restaurants in Malaysia have the options for so many “spare parts” for grilling and KNK group of branches are the sole restaurants with such availabilities. 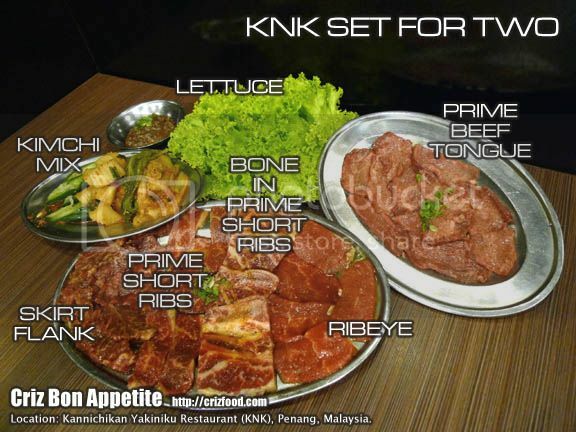 Speaking of condiments, KNK is also the expert in providing their homemade sauce paired with the right choice of meat. 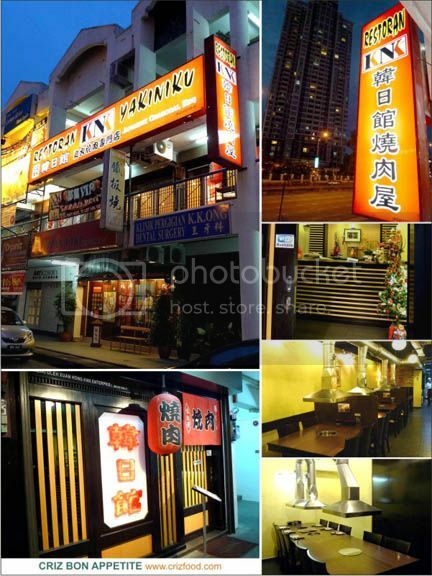 Kannichikan Yakiniku Restaurant has been in Penang since August 2000. Although it’s visible along the main road of Jalan Tanjung Tokong, it tends to be missed by many locals and visitors as it’s located on the 1st floor of Desa Tanjung. If you are coming up from Pulau Tikus/Bagan Jermal/Gurney Drive into Jalan Tanjung Tokong, drive on until you have reached the second traffic lights (Precinct 10 and Island Plaza will be on your right). At the traffic lights, turn right into Jalan Seri Tanjung Pinang (leading to Straits Quay). Immediately turn right, keep slow and turn left into the service road. That’s where Desa Tanjung is. Find a parking space and walk up 1st floor and you would see the restaurant there. Parking can be quite scare during certain peak period of the day. It’s advisable to park your car at the Island Plaza car park and walk over to the restaurant. Address: 125-N&O, 1st Floor, Desa Tanjung, Tanjung Tokong, 10470 Penang, Malaysia. D-25-1, Lorong Bayan Indah 2, 11900 Bayan Lepas, Penang, Malaysia. 42, Jalan 28/70A, Desa Sri Hartamas, 50480 Kuala Lumpur, Malaysia.